These days, I tend to gravitate towards my go-to skinnies and a flowy blouse or tank with sandals. To get more wear out of the rest of my wardrobe, in this case maxi skirts and fitted tees that are not flattering to my post-partum belly, I've just been pairing them together and tying the top at the waist. I also wear my bumped by blanqi for target tank underneath to smooth everything out, for good measure. We were driving to Denver for the day and I wanted something casual, yet exciting for this outfit -- I'm kind of obsessed with the way it turned out. It felt comfortable, but was much less frumpy than jeans, keds, and a tee ((which is pretty much what I wore all weekend haha)). This will be my go-to combination any time I'm wanting to wear a t-shirt, but also wanting to feel put together. Also, this skirt might seem a bit short for a maxi, but y'all...any shorter and I'm constantly tripping. 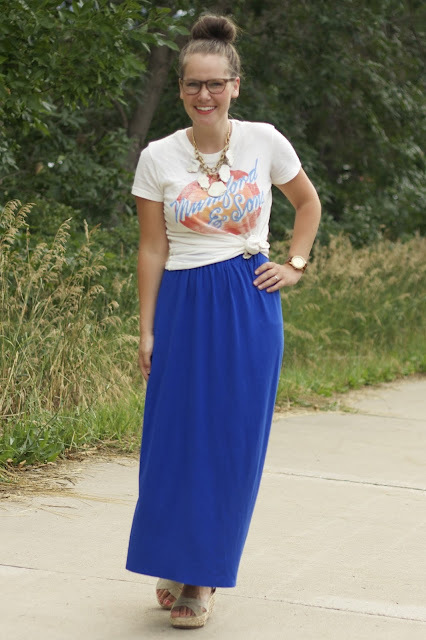 Such a cute way to style that maxi! Love this!!! You always look so cute Kim! I love the way you tied the top + all the colors in this outfit!! adorable! 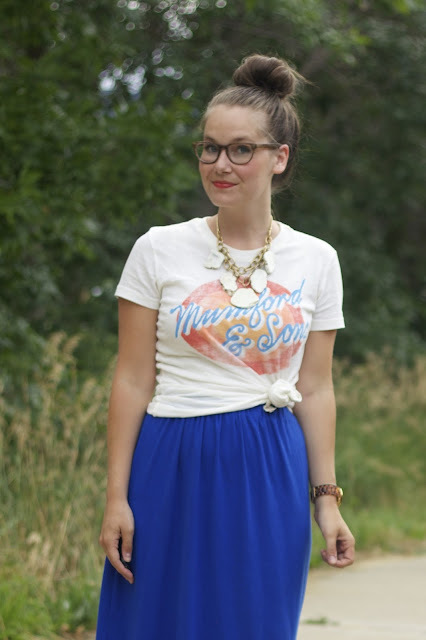 Love that blue in the skirt and you look great in a top knot! I love this look! 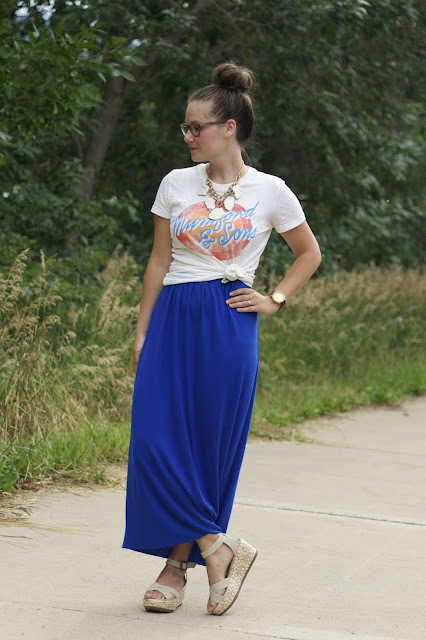 Such a fun and feminine way to wear a tee! Can you post a link on how you made your skirt? So cute and I'd love to try it! bought yardage of the length I wanted it to be, sewed the selvedges together for one back seam, folded over the top & sewed an elastic band casing, inserted the elastic and left the bottom raw. no problem, it's easy peasy! I think the skirt is a good length! That does look like a ridiculously comfortable traveling outfit. maxi skirts are the best for so many reasons. 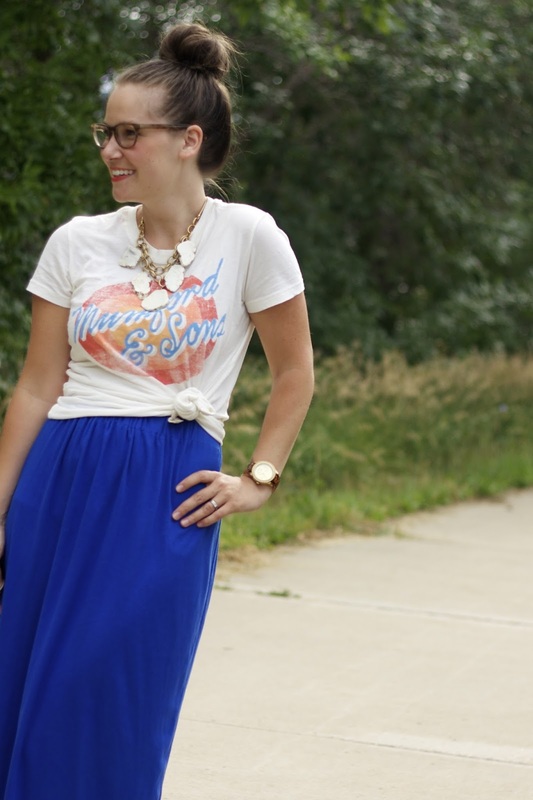 yessssss for maxi skirts & tied t-shirts. do you remember when tying shirts with a scrunchie was in? should we bring that back? haha i use a fold-over elastic hair-tie for mine!! paying homage to junior high. Adorable outfit! I especially like the addition of the big clunky necklace. I always like the way that looks, but I'm afraid I couldn't pull it off. I love this look. 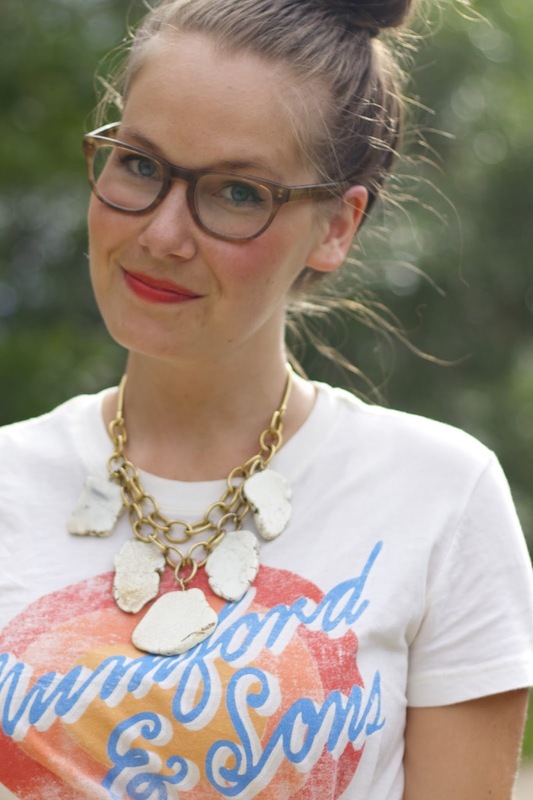 I've been seeing a couple graphic tee goes glam looks recently that I love, but just haven't found the "right one" to make my own look with. You look fantastic though and who doesn't love Mumford!? I was wondering if you made/sold those maxi skirts? because I'd definitely be interested in buying one!! PS ~ That necklace. I'm DYING over it! Is it coral chunks? I love this outfit!!! And what a great concert t! You are the CUTEST, and I love this look! Mumford & Sons!!! man, I bet that was amazing. 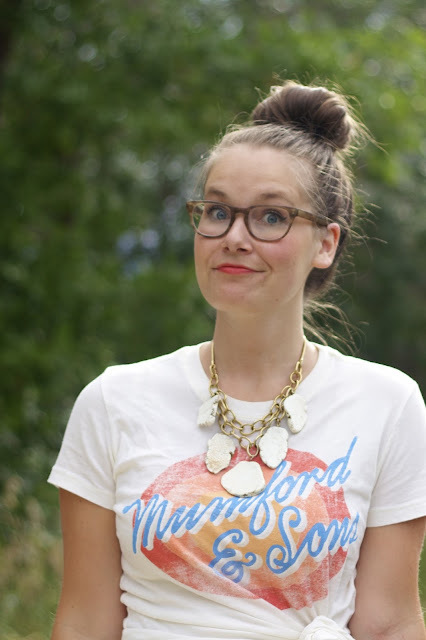 and that shirt is seriously cute for a concert tee. Thank you for linking up with Style Sessions. new follower! We must be style soul mates friend, because my typical outfit sounds the same as yours (skinnies with flowy tops - yay postpartum bodies!) but today I'm wearing almost the exact same outfit as this post. Just instead of a t-shirt tied in a knot, it's a denim chambray shirt tied in a knot. Saw your link up on the Pleated Poppy. I'm fairly new to WIWW and wondering who takes your awesome pics! I'm tired of taking my own in the mirror! Love the outfit and hair do! I saw the t-shirt and knew it could only be from the concert! I went to one in Boston -- I definitely agree that it was the BEST EVER! Love that you paired a t-shirt with a maxi-skirt too, really cool and unique. I always look forward to your posts! Have a good one! I LOVE love this look. It's totally my style. Anyway I'm going to give a try. 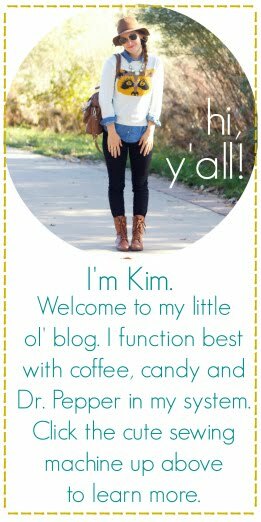 You look adorable Kim! Also, I want to thank you again for a fab IN class on fashion blogging. I really enjoyed it and some fun ideas are flowing for some new fashion fun on le blog come fall. I've wanted to do fashion-y features for awhile but I've shied away from them for fear of coming off proud or not life-giving, but you helped me realize that I can celebrate my love of fashion and pretty things in a godly way because He gave me this love. I'm very grateful to you! i love this. and red rocks. and mumford! what fun!